Let’s start with some definitions, as there is often confusion when dealing with diverticulitis and diverticulosis, because they sound so similar. Then we’ll talk about how you manage diverticular disease so that it has as little impact as possible on your quality of life. 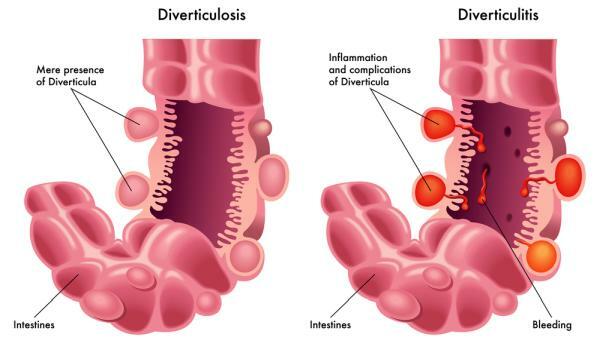 Diverticulosis and diverticular disease are interchangeable terms that describe the presence of diverticula in the large intestine (colon). Diverticula are pockets in the wall of the colon, most frequently in the lower section (which is on the left side of your abdomen). Most often they are tiny pouches ranging up to half an inch in size. More rarely they can approach an inch in diameter… very extreme cases have been reported up to 10″. These pouches or colonic diverticula “balloon” through the colon wall – see the image below. They’re common in people who eat “Western” diets, and incidence increases with age. About 5% of the population under 40 have them, increasing to about 50% in those over 50 years of age. By age 79, up to 75% of the population have diverticula. Diverticulosis is often present without any symptoms. We’re not completely sure what causes diverticula. Medical research believes that there is a connection with a Western urban diet, but the exact causes aren’t known. There is a theory that constipation causes stress when eliminating, and the resulting straining creates pressure that causes the intestinal wall to balloon out… over time, weak spots become diverticula. In about 10 to 25% of diverticular disease patients, the diverticula become inflamed and/or infected. This is known as diverticulosis, or a diverticular disease flare-up. Symptoms can include diarrhea, abdominal cramps, intense pain, bleeding, bloating and fever. The lower left side of the abdomen is where the most pain and tenderness typically appear. In extreme (rare) cases, bowel obstruction, perforation of the colon or hemorrhage can occur, which may trigger fever, nausea, and vomiting. These complications can require hospitalization or even urgent surgery. Diagnosis of diverticula can be challenging as symptoms overlap considerably with IBS (Inflammatory Bowel Syndrome). It’s important for your physician to pay careful attention to your history of symptoms, as well as deliver a thorough physical examination. Blood tests and other tests can be helpful in diagnosis. X-rays combined with a barium enema can help by showing information about the shape and function of the colon. Colonoscopy examination is effective for diagnosing diverticula, and a less invasive examination of the lower bowel called a sigmoidoscopy examination can also be an option. Unfortunately, during periods of a flare-up (diverticulitis) the area may be too inflamed and tender to perform these examinations without undue risk of bowel perforation. In these cases, a CT scan (computed tomography) might be the best option for diagnosis. Avoiding diverticulitis involves dietary changes. In particular, your diet must include regular high-fiber content and plenty of fluids. It’s important to eat regular, well-balanced meals and keep your colon active, avoiding constipation. Softer stool passes more quickly and easily through the colon. Fiber both softens stool and provides a “scrubbing” action in the colon, removing particles of hardened stool that could irritate diverticula. Hydration is also critically important to a healthy colon. If you have (or suspect) diverticula, it’s important to consume 20 to 35 grams of fiber daily, split among all of your meals. You’ll learn to read food labels to look for higher fiber choices. Some people will tell you that you need to exclude seeds, corn, or nuts from your diet, but this has does not seem to matter as long as your digestive system is working well and you are consuming plenty of fiber. In our holistic medical practice, we’d look at your diet and your digestion, ensuring you have sufficient stomach acid to be digesting your food, and that you were staying hydrated. Supplements such as magnesium may also be helpful in softening stool… and many people are magnesium deficient anyhow. Our practice can advise you on dietary choices, supplements, and even test for food allergies that may be playing a role in your digestive health. We run the Hong Kong Gut Health Centre, so we take digestive health very seriously and have a lot of experience in identifying issues such as leaky gut, diverticulosis, IBS, gut dysbiosis and more. Taking action to avoid diverticulitis is important. If in spite of your best efforts, you have a diverticulitis attack, you will want to have medical assistance. There are a number of possible interventions when dealing with flare-ups, such as restricted or liquid diets, pain medications, antibiotics or antispasmodics. It’s impossible to say what would be the best choice for your particular situation without consulting with you in person. If you are concerned about diverticulitis, please make an appointment at our Hong Kong medical clinic. Just call (+852) 2523 8044 or email us.